You are currently browsing the tag archive for the ‘Romanticism’ tag. Last Monday Stephanie and I travelled out to Kiama to take in the sights. It was a beautiful day, the sun was causing little birds to queue up for shallow bird baths and the town itself has a lovely series of shops that stock tasty condiments, dessert sweets and some unusual jewellery. There was of course also a second-hand book shop, which I made a bee-line for. There I picked out this book, as I have always wanted to learn more about Vita Sackville-West. All I really knew about her was that she inspired the Virginia Woolf’s novel Orlando. Indeed she is most famous these days as Woolf’s lover, a great woman reduced to a footnote. I flipped through the book, with its water-damaged cover and dedication dated 1939 – and found on the back page a poem written by the book’s original owner. What is a tree before the Spring? When does it most delight the age? How much is figure, how much dress? Anyway, back to the business of reviewing. The English weather is cited as a temperate ideal envied by ‘exiles’, in other parts of the world. I have not understood humanity. The passing of the seasons is shown not just to require different activities in relation to harvesting and husbandry, but in turn causes the men who work the land to change. The fields that have been ploughed and tilled should not be mistaken for a beaten opponent. Those who work the land should respect it as an ally, a companion. Somewhere in between the free-flowing verse of pastorals and the dry concerns of farming, a middle-ground is sought, where true understanding can be found that outstrips empty talk of Nature(!). 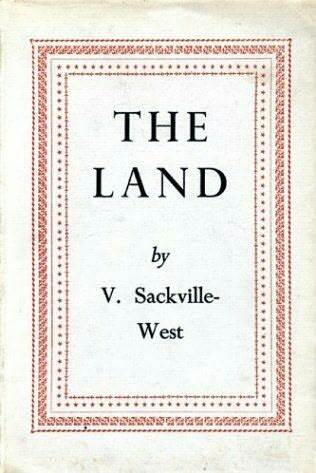 To a contemporary reader perhaps Sackville-West‘s language seems too old-fashioned, but consider the audience she was pitching this work to. The Land received the Hawthornden Prize in 1926, so I imagine her message was heard. Of course the idealism and forward-looking culture that rose up following the ‘Great War‘, would soon be lost..
A socially conscious corrective to Romanticism, beautifully captured. One more page, she decides; just one more. She isn’t ready yet; the tasks that lie ahead (putting on her robe, brushing her hair, going down to the kitchen) are still too thin, too elusive. She will permit herself another minute here, in bed, before entering the day. She will allow herself just a little more time. Johann Goethe is credited with having inspired the dolorous Romantic movement that followed the publication of his work The Sorrow of Young Werther. The German author would later disown Werther, for inspiring what he felt was a ‘sick’, morbid melancholy, a fascination with the act of suicide itself. “It must be bad, if not everybody was to have a time in his life, when he felt as though Werther had been written exclusively for him.” I wonder if Virginia Woolf were to have lived to see the publication of The Hours might she have expressed similar regrets. The Hours tells the story of three women fascinated by the story of Mrs Dalloway. It begins with the suicide of Virginia Woolf herself, before returning to the period during which she conceived the novel. This is intentional, as her work, for better or worse, will forever be defined by the manner of her death in the minds of her readers. We then skip forward to the present day, where a Clarissa Vaughan, much like her namesake, is feverishly planning a celebratory party for her old friend Richard, who has won a prestigious literary award. She is also caring for her friend, who is dying of AIDS and is rapidly losing his grip on reality. Finally we meet Laura Brown, a pregnant housewife who is obsessed with Virginia Woolf and her novel Mrs Dalloway. She feels trapped by her marriage to her war hero husband, petrified by the responsibility of being a mother to her young son Richard, while all she wants to do is retreat into a book and hide from the world. The parallels between the lives of these three women and the novel Mrs Dalloway are teased out by author Michael Cunningham. Obviously in the case of Virginia Woolf we see how events in her own life inspire the characters and situations introduced into her writing. Where she is offhand to her servants, Clarissa Dalloway will be caring and considerate. Her feelings of depression inspire the character of Septimus Warren Smith. Laura Brown takes inspiration from Woolf in reflecting about her own life, whereas Clarissa is mocked by Richard with the nickname ‘Mrs Dalloway’. As well as focusing on the importance of Woolf’s writing, this is also a book about how the challenges faced by homosexuals have changed by the end of the 20th century. In Woolf’s time gay men and women conducted their lives in secret (speaking of which, gamahuche is my favourite euphemism – ever!). Now gay lifestyles are more visible, yet the bigoted view that AIDS is somehow a ‘gay disease’ is expressed openly by homophobes. These are important issues and I am glad that writers like Cunningham are unafraid to deal with them. So why do I find this such a trite book? In part it is the aping of Woolf’s style. While I found the language of Mrs Dalloway flowed and sang with a natural rhythm of its own, the imitation attempted by Cunningham feels like purple prose. This is also quite a humourless book, full of doomed characters reflecting on self-slaughter. When Tom Stoppard wrote the script to Shakespeare in Love he wisely avoided hammy portentousness and self-indulgence, throwing in digs at the expense of England’s Greatest Writer ™ (I had that Christopher Marlowe in my boat once). Cunningham has Virginia and her husband casually discussing “Tom’s mistakes”, presumably a reference to T.S. Eliot’s The Wasteland, which they published under the imprint Hogarth Press. This attempt at levity comes off as pretentious name-dropping. It gets worse when Clarissa in the present day is amazed at the sight of Meryl Streep entering her trailer on a New York street. Perhaps in an attempt at po-mo humour Stephen Daldry cast the actress as Clarissa in the film version of The Hours. Both she and Laura are overly enamoured with famous actresses in the book, making their profundity strangely trivial. This tiresome book is Twilight for New York literary salons, little more than turgid and pretentious fanfiction.